O'ahu's lush Hakipu'u Valley is renowned in Hawaiian culture for its beauty and plentiful resources. The fertile makai (oceanside) flats are home to the valley's only lo'i kalo (wetland taro fields) in cultivation since ancient times. Native Hawaiian farmers still use traditional methods extending back many generations to farm the taro here. The lo'i kalo provide a rich ecosystem that supports native plants and animals including pinao (Hawaiian dragonfly), 'auku'u (black-crowned night heron), and 'o'opu (goby fish). 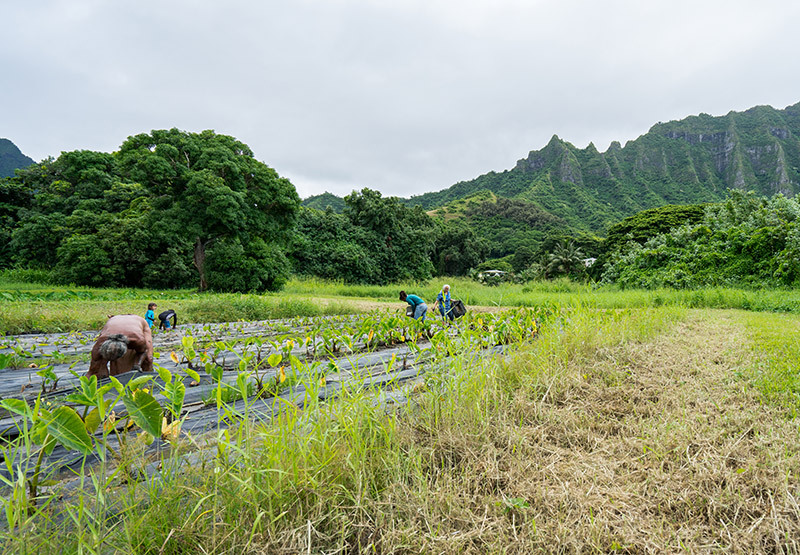 We are working to purchase this taro farm and transfer it to Ka Huli O Haloa, a local nonprofit supporting Hawaiian cultural traditions and education. In partnership with area farmers, Hakipu'u Learning Center and other schools and community groups, Ka Huli will steward the property as a working farm and living classroom that will support food security on O'ahu and strengthen connection to Hawaiian culture and the history and traditions of Hakipu'u.